When board games (and video games) are reviewed or critiqued, its “replayability factor” is often one of the core elements that is brought up. It makes sense. After all, if you lay down $50 for a game, you’re going to want to play it more than once, or it becomes one expensive hobby. And of course, you want it to be fun every time you play it. Otherwise what’s the point? But what is it that makes something replayable? I think in reviews, the category of “Replayability” generally takes into account variability – how the game can change in different playthroughs. 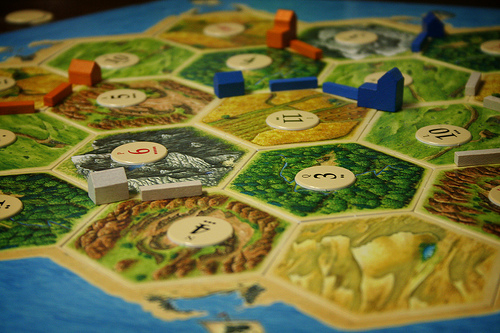 For example, Settlers of Catan is pretty variable – each time you play, you randomly build the island from a set of hexagons, resulting in a different arrangement of resources. Kill Dr. Lucky, however, is not very variable – the board is the exact same every time, the humorous “failure” cards never change. However, I think if you only look at this factor, the amount of variability, in determining replayability, you’re missing some key elements. In fact I think variability is highly overrated. I’ve narrowed down what I think makes a game “replayable” to these 3 factors. A game that does one of these well will likely be a pretty replayable game; hit 2, and you’re doing pretty good. All 3 and you’ve got a masterpiece. Yes, I know, I just said that Variability is highly overrated, and I still say that this factor is the weakest of the 3. However, it still remains that if your game changes from session to session, this can make it fresh each time it hits the table. Settlers of Catan has a pretty solid reputation for being a good, replayable game, and it’s definitely got the variability. The best example of variability I can think of, though, is Cosmic Encounter. Beyond simple bonuses and penalties, the nature of the various races in CE results in essentially a different game, sharing the same mechanics, each time you play. It is possible, perhaps, to be too variable – if you have to completely re-learn a game each time you play because it is totally different… well, that doesn’t seem to be too attractive. I don’t know of any game that does this, but if you’re thinking of making one… maybe don’t do that. I think this is far more important that simple variation of the board layout, or whatever else you vary. If a game’s layout changes, but it’s still played exactly the same way each time, to me that’s less replayable than a game that allows you to approach each new session with creativity. 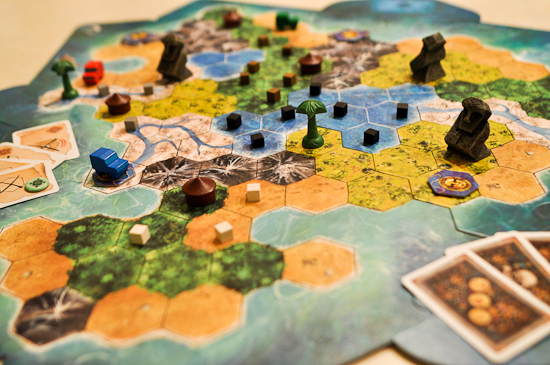 Tobago, for example, is a very nice-looking game which easily changes up the layout of the board from play-to-play. However, regardless of the setup, the path to victory is essentially the same each time – spread your own clue cards out, protect yourself with amulets, position yourself to dig up treasure. In Catan, even with the simple nature of the change, the way the resulting map falls together can drastically affect strategy. Do you try and spread out to get a lot of different resources? Do you focus your energy to become the controller of one resource? do you focus on numbers instead of what you get from them? Do you go after cards instead of settlements? With multiple approaches to victory, you have to consider your options and strategize each time you play. You can’t depend on a lazy strategy that always works. You have to pay attention, and engage with the game, and that makes it worth playing again. Well this is obvious, isn’t it? Shouldn’t all games be fun? Of course they should. And all games should be very replayable, too. The fact is, though, that some games are just not fun. Some games rely on gimmicks that are fun the first few plays, but fall to the wayside once the excitement wears off. And then, some games are just fun. Really really fun. So fun they’re worth playing again and again, with the same people, with different people, with whatever. It doesn’t really matter if the board looks completely different every time or if there are 15 ways to approach victory, the game is just fun. Sometimes it’s the art style; sometimes it’s the theme. Sometimes it’s just an undefinable factor. Let me throw out some examples. Carcassonne, in my opinion, is very very fun. And if you are completely honest, it’s not very variable, and there aren’t many approaches to victory. Sure, you have a “board” that ends up completely different at the end of the game… but the game itself is laying down the tiles. Sure, the order changes, things get placed in different places, and you don’t know what exactly to expect the game to look like at the end, but it’s basically dominoes with better art and a little extra strategy. And it’s not like there’re a ton of drastically different approaches to winning. You either go for big, point-filled farms, or you try and spread yourself out over as many cities and roads as you can get, or a strange mixture of both. But Carcassonne is just fun. So fun, it’s worth playing again. Another example: Kill Dr. Lucky. Even less variable than Carcassonne. The board never changes from play to play. The goal is always the same – whittle the failure cards out of the other players until you can strike Dr. Lucky at the opportune moment and take him out. But through its delightfully zany humor conveyed with excellent writing, Kill Dr. Lucky is fun to play over and over. In conclusion, if I were to sum up replayability in one word that was not “replayability,” that word would be “engagement.” Whether it be a totally new face each time the game is played, multiple ways to reach victory, or just plain old fun, a game that is truly engaging will find its way back to the table again and again for maximum enjoyment. So what do you guys think? Do you disagree with any of my elements? Do you think there is more to replayability? Share your thoughts in the comments or on twitter (tweet @futurewolfie)! how do you define the difference between player and social interaction? Player interaction is game related. The decisions others make in the game affect the decisions you make, which makes the game more interesting and replayable. Social interaction is not necessarily game related. It’s the social time that the game fosters. I think here of games like The Game of Things or Canasta. They foster conversation, but it is not a result of player decisions in the game, really. I guess I see player interaction as strategic, social interaction as incedental to the game, if that makes any sense. Certain games are better at fostering a good social group experience, and that makes them fun rather than the decisions inherent in the game. Very good post about a very important topic! Except for a few little points, I agree with you. Carcassonne is truly not fun, however, and Tobago (in the 2-player game especially) does actually have a decent degree of MATV (in that you can choose to either spread out your clues or focus them on one or two treasures, and how you can collect amulets to pull off crazy shenanigans near the end of the game). You sort of poo-pooed “Variability”, though, and while I understand that it may be least important to you in determining how many times you want to play a game, it’s often the one factor that game designers have the most control over when putting together a game. It might be cool to really explore some of the specific components and mechanics that are used in games (modular boards, decks of cards, player roles/powers, etc.) to add extra replayabilty, and maybe even a discussion of how well each one works. I like the post. Replayability is super important to me when I buy games and I give it a separate rating in my reviews. I think you hit the nail on the head for the most part. I think the key to replyability is simply – will I experience something new on my next play, or will it be more of the same. Settlers gets pretty high marks because the different island also results in different goods being scarce or plentiful. It also has several different strategies that can be effective, so my individual plays might look different. On the other hand, Carcassonne isn’t all that variable. Pick up a tile and plunk it down. So, as fun as it may be (and I do enjoy it), it’s Replayability is rather on the low side. The experience is always the same. I typically only play the base game with new players and have to add in a few expansions to want to play in my usual group.